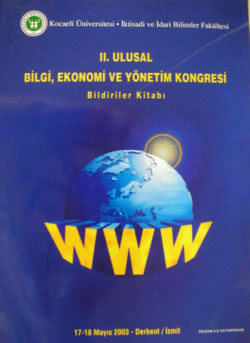 The name of the Conference is the INTERNATIONAL CONFERENCE ON KNOWLEDGE, ECONOMY, AND MANAGEMENT. To bring the researchers, experts, scientists, and practitioners working in the fields of Knowledge, Economy, and Management together; to provide an environment conducive to sharing, discussing, and spreading new information and opinions; and to ensure that scientific results are transferred to relevant organizations and institutions and are made available to the public. 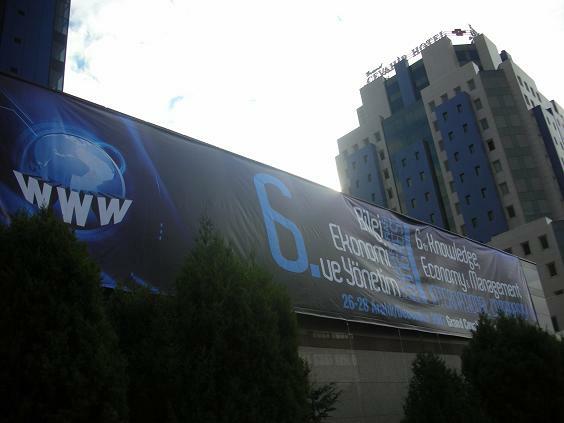 The logo of the Conference is the letters WWW in front of the Earth rotating on its axis. 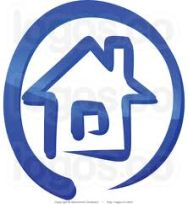 This logo may be used in different compositions for each Conference; it may not, however, be changed. The standard dates of the Conference fall around September – October. The Conference is held at least every two years but no more than once a year.. The Board of Directors may change the dates and period of the Conference if it deems it necessary. The Conference has four main bodies: the Science Board, the Executive Board, the Board of Directors, and the General Secretariat. An Advisory Committee and/or Honorary Committee may be formed if so required by the Board of Directors. Duties and powers of existing bodies may not be transferred to bodies that formed at a later time. Scientific Board: Consists of academicians and practitioners with advanced degrees who have conducted academic studies and who contribute (or who may contribute) to the improvement of the Conference. Scientific Board members are appointed by the Board of Directors following recommendations by the Executive Committee; the Scientific Board consists of a new panel of members every Conference. Members of the Board are automatic members of the Science Board. The standard dates of the Conference fall around September – October. The Conference is held at least every two years but no more than once a year.. The Board of Directors may change the dates and period of the Conference if it deems it necessary. 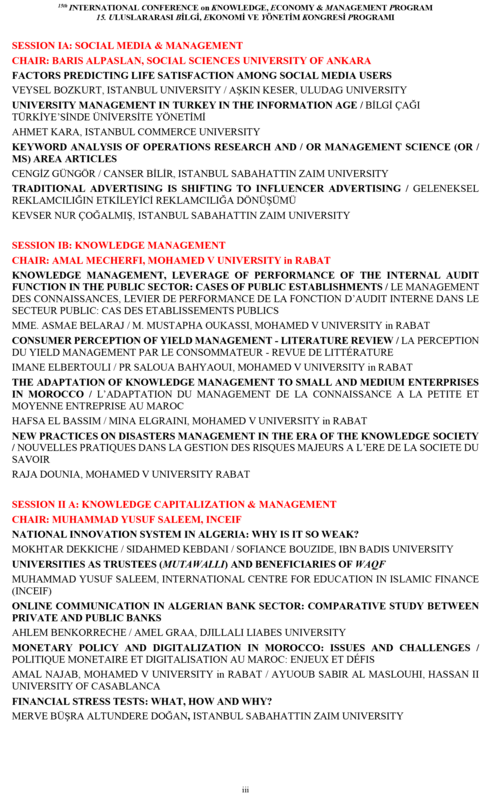 Board of Directors: Composed of academicians who have contributed to the formation and improvement of the Conference. It is a permanent body and the top body of the Conference. 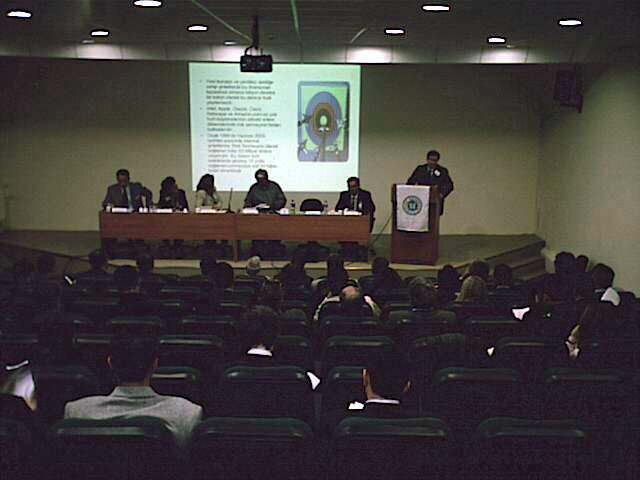 Dean of the University in charge of the Conference are automatic members of the Board. Gatherings of the members of the Board are initiated upon the call and agenda of the General Secretary. A Chairman is elected at each meeting and the agenda is discussed. Absolute majority of the attendees is needed for a resolution. In cases split decisions, the resolution that Chairman votes on on behalf of the Board is considered valid. Persons who are not able to attend a meeting due with a valid excuse may assign other members of the Board as proxies. If it is not possible to gather in a physical location, member opinions may be taken via e-mail. Board membership expires upon resignation or upon the failure to fulfill any of the obligations for any reason. No replacement is made for the members whose membership is expired upon resignation or upon the Board's decision. The Board of Directors may elect a new member with the written proposal by 1/3 of the total number of Board members and with the consent of 2/3 of the members. -To form, whenever necessary, an Inspection Board consisting of three Board members and to determine the term and powers of this Board. Executive Board: Carries out activities necessary for the proper organization of the Conference in light of the assessments of the Science Board and the decisions of the Board of Directors. 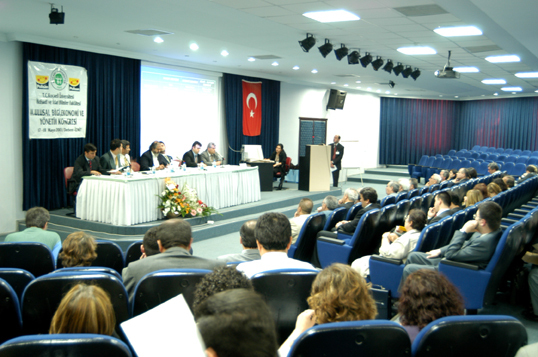 It is composed of academicians appointed by the Dean of the faculty in charge of the Conference. The Chairman of the Executive Board is the faculty's dean. The Chairman holds the title of Head of the Executive Board. The number of members and meeting rules we well as other principles are determined by the Chairman. The Secretary General also attends meetings whenever necessary. 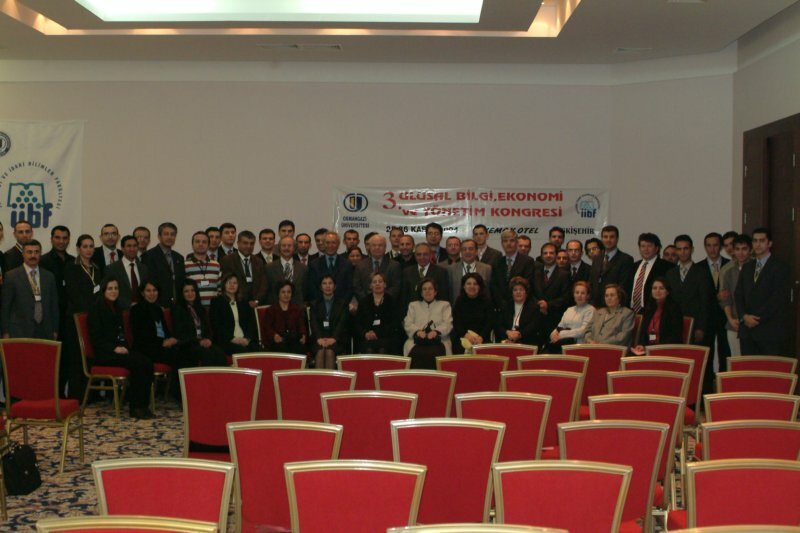 Honorary Committee: Composed of representatives of the persons or organizations who support the Conference. Members of this Committee are elected for each Conference. It has no duties or powers over Management and Execution issues (added to the Rules with the Board's resolution number 3 dated November 4, 2006). General Secretariat: This is the body that ensures the coordination, communication, and inspection of the Boards and Committees pursuant to the resolutions of the Board of Directors. It is managed by the Secretary General. The Secretary General is elected from among the academicians who have contributed to the Conference and is decided by the Board of Directors by a majority vote. His or her term of office is 5 years. Working principles and secretariat are determined by the Secretary General. The Secretary General may assign a maximum of two deputies if he or she finds it necessary to do so. 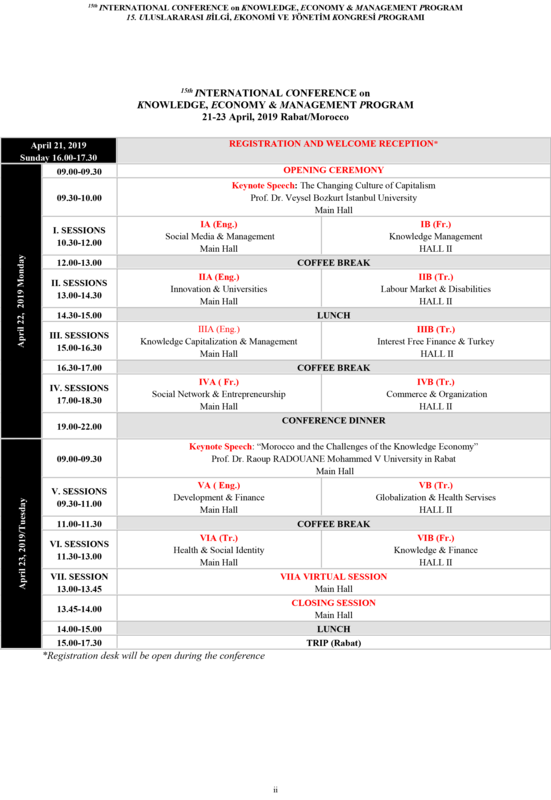 The faculty who wish to organize the Conference should pre-apply to the General Secretariat. They should be sure to submit their recommendations on schedule and to draft the budget and other relevant issues, in writing, to the Board of Directors at the beginning of the Conference. The Board of Directors selects which faculty shall be appointed to organize the Conference by considering whether its own financial and academic infrastructure is sufficient and then by considering the nominated faculty’s participation and contributions to previous Conferences. The final decision shall be made by majority vote and announced at the closing session. If the faculty designated to organize the Conference fails to fulfill its obligations, the Board of Directors, upon the proposal of the Secretary General, may appoint another faculty that had also made an application to organize the Conference. Conference rules may be changed with the written proposal of 1/3 of the members of the Board followed by a unanimous vote. The Board of Directors is authorized to make decisions on issues not covered by Conference Rules. These Rules of Conference shall be executed by the General Secretariat as of September 15, 2005. 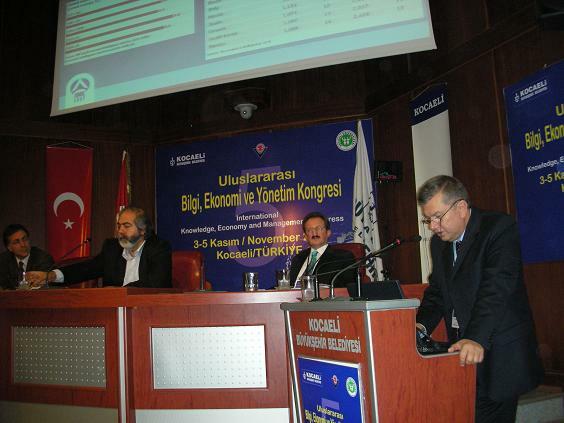 Dr. İbrahim Güran Yumuşak was appointed as Secretary General at the Board Meeting dated September 15, 2005 following the proposal of the members of the Science Board and upon the approval of the Board of Directors. Papers that have not been submitted by their authors without any valid excuse and that have been sent to the subsequent Conference are automatically rejected without being assessed, and the institution of these persons shall be notified of the situation (Board Resolution number 4 dated September 15, 2005). 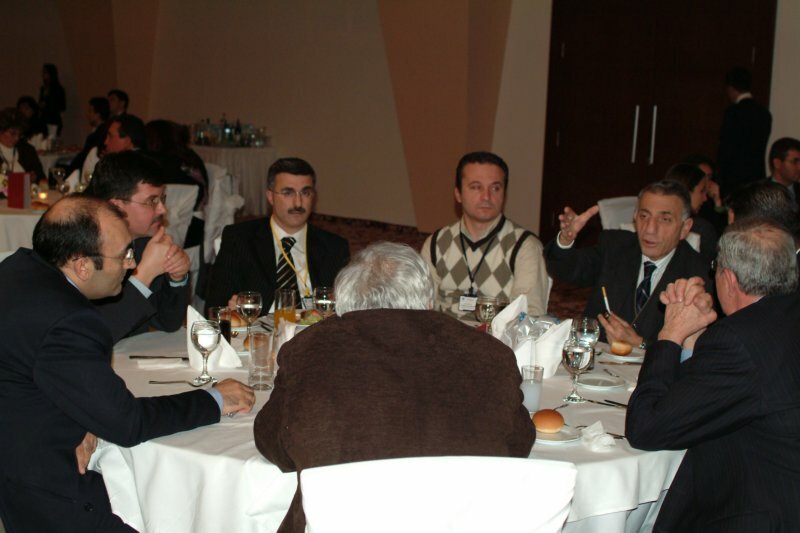 The Honorary Committee has been added to the bodies of the Conference following Board resolution number 3 dated November 4, 2006. 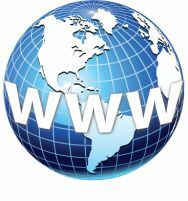 It has been agreed by Board resolution number 2 dated November 4, 2006 that preliminary works will be made to publish an academic journal that will be indexed by scientific datebases. It's been agreed by Board resolution number 5 dated November 4, 2006 that an engagement letter will be signed with Dr. Risa Lieberwitz, the representative of Cornell University, so that the sixth Conference will be held at an international level. 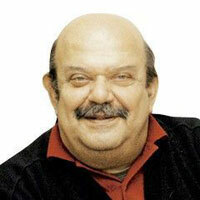 Dr. Tuncay Güloğlu has been appointed Vice Secretary General of the Conference as of December 12, 2006. 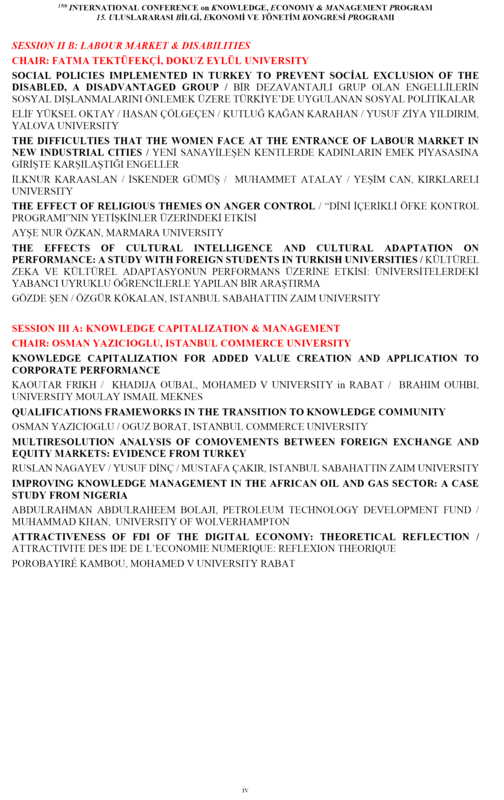 Refereed Papers (full papers): Should be submitted as a full publishable manuscript with empirical findings, or conceptual/qualitative research articles. After acceptance, the full refereed papers should be formatted properly with no more than 4,000 words. All accepted papers will be published in the refereed conference Proceedings. Work-in-Progress Papers (Extended Abstract): Please submit an extended summary of your proposal/paper in no more than 1,000 words. 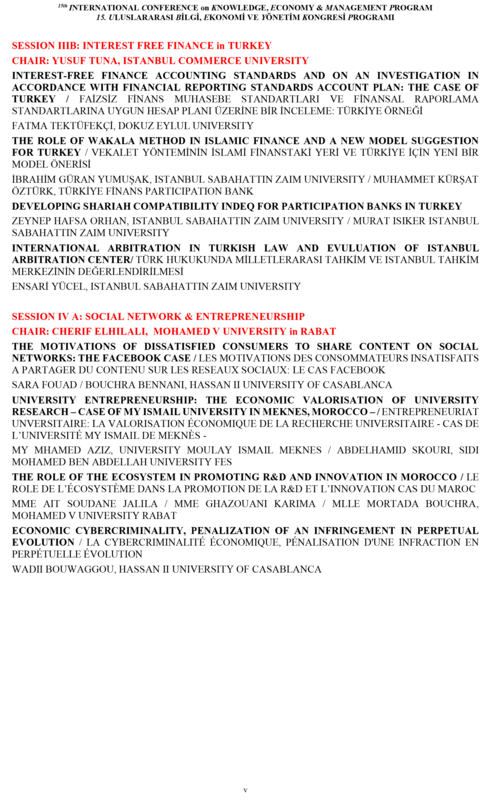 These papers will be scheduled for presentation, and the abstracts will be included in the conference program. Work-in-progress (WIP) papers could be proposed conceptual framework based on extensive literature reviews, or research in progress papers with partial results. Virtual or Poster Paper: We understand that some presenters will be unable to make the trip to Malta to present their paper, mainly due to financial and/or political restrictions on travel. ICKEM 2014 has therefore instituted a virtual or poster papers to allow the authors of accepted proposals the same publication opportunities as regular presenters. Panel Organizer(s): Panels should have at least five participants (including the chair). Panel organizers are responsible for the arrangement of all the presenters under their proposed topics, and should ensure that all are firmly committed. If your proposal is accepted you will be invited to register for the conference. Please send your abstracts via Online Abstract Submission System, until January 1, 2019. 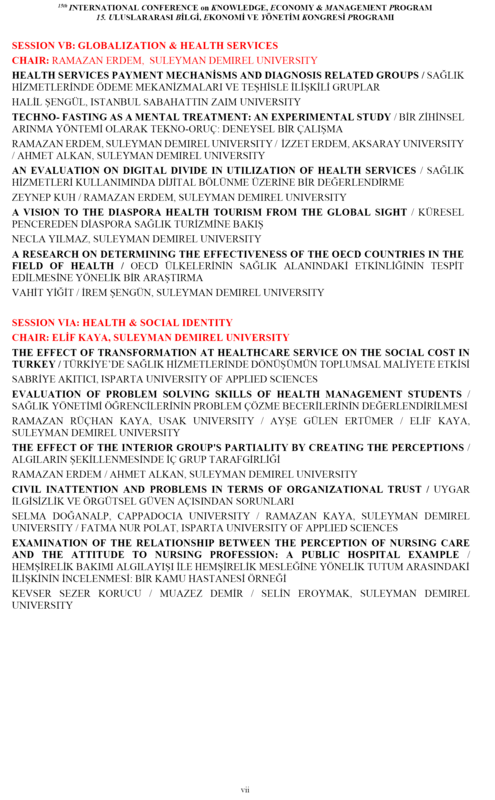 Abstracts include the aim of the paper, methodology and finding. A begin with an abstract of 300 words or less. The abstract should be single-spaced. Type size should be 12 point. Every article should include two keywords minimum. If you have not submit the abstract to the conference you can submit with extended abstracts (1.000 words) or full text papers. Submission deadline is March 1, 2019. for this. 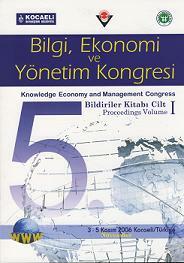 Extended abstracts or full text papers must sent to kongre@beykon.org as a word document. A. The base font should be set to Times New Roman in a 12-point size. The title should be printed in capital and bold letters, and should be centered. The author(s) and affiliation(s) should be flush right, single-spaced, and typed beginning on the second line below the title Use 12- point type. The titles such as “Dr.” or “Professor.”, the institution’s name and country, and the e –mail address will be written respectively in the footnote. Additional authors and affiliations should be stacked under the first with no space between. B. All papers begin with an abstract of 300 words or less. The abstract should be single-spaced. Type size should be 10 point. Every article should include two keywords minimum. C. Type size of the tables, footnotes should be 10 points. The letters and the graphics and the tables should be non-colored. D. You must use Microsoft Word 6.0 or higher (PC version) and the text should be full justified. Margins of the A 4 paper should be set at 1.25 cm top and bottom, and 2.5 cm right and left. E. Single space the body of the paper and between paragraphs. F. Citations in the text should list the author’s last name, comma, and publication date, and the page number, all enclosed by parentheses, i.e., (Yumusak - Erarslan, 2005: 520). G. The first letters of the headings should be in capital letters and the headings should be in boldface. They should be numbered as 1, 1.1., 1.2.1., and so on. H. Tables and graphics should appear within the body of the paper and should be numbered consecutively. The figure or table number and description should appear left-justified in boldface 10-point type at the top. The resource of the table and figure should appear at the bottom in boldface 10-point type. I. Appendices, if used, original documents, maps, pictures etc… should be numbered and follow the references. The word “Appendix” should be at the top of each appendix as a first-level heading. If there is more than one appendix, number each consecutively. J. The references should be written following the text in alphabetical order. Howitt, Peter (1998) “On Some Problems in Measuring Knowledge-Based Growth,” The Knowledge Economy, Ed. 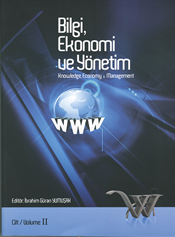 Dale Neef, Butterworth-Heinemann, MA Yumusak, İbrahim Güran-Cemil Erarslan (2005) “Yeni Ekonominin Maliye Politikalari Üzerindeki Etkileri ve Gelismekte Olan Ülkeler Örneği,”IV. 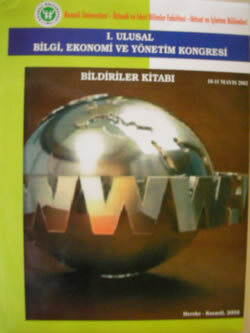 Bilgi, Ekonomi ve Yönetim Kongresi, Sakarya Üni. 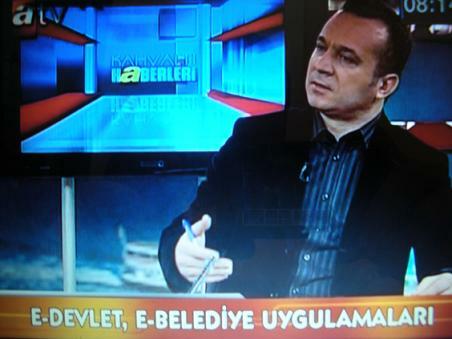 İ.İ.B.F. Yayini, Sakarya. K. Number all pages in the lower center and use 10-point type. L. Full papers have to be between 10 and 25 pages. 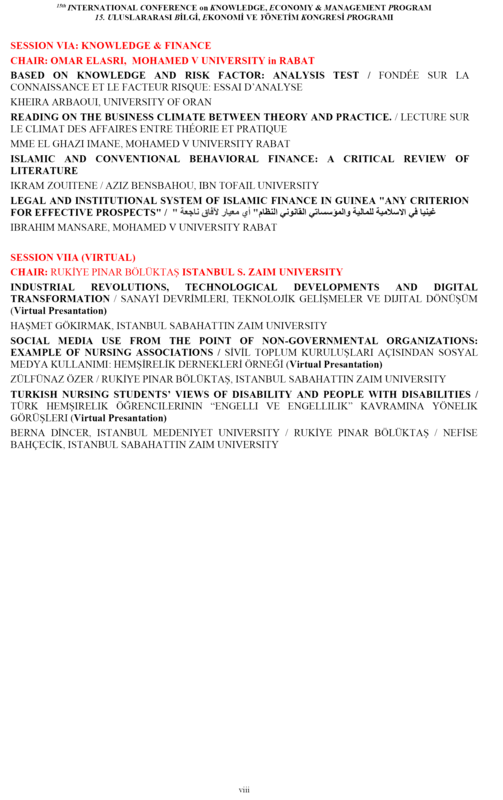 The Refereed Conference Proceedings reviewed in Electronic CD-ROM Format and Proceedings Book with ISBN. The Refereed Conference Proceedings Book and CD-ROM will be included in each Conference Registrant's Packet. 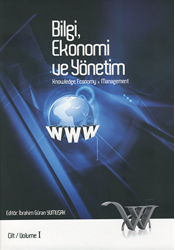 The conference has teamed up with the International Journal of Knowledge Economy and Knowledge Management (The JKEM) for publishing a Special Journal Issue on Knowledge Economy and Knowledge Management indexed by EBSCO, ASOS Academia. All submitted papers will have opportunities for consideration for this Special Journal Issue. The selection will be carried out during the review process, as well as at the conference presentation stage. Submitted papers must not be under consideration by any other journal or publication. The final decision will be made based on peer review reports by the guest editors and the Editor-in-Chief, jointly. Each abstract requires a registration. 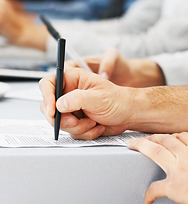 In case the same author presents more than one abstract, for each additional abstract a different co-author must be registered to the Congress, or Second and further abstracts by the same author will be charged as fifty percent of the preferred registration fees for each additional abstract. It will be announced when the referee evaluations are concluded.